Soppressata is a natural with roasted peppers, in the same way anchovies are–they’re both very strong and salty, and pair beautifully with the sweetness of the peppers. Last week at the farmers’ market, I bought some Florida red peppers–they were uniformly a deep red color and some were beginning to shrivel a bit–I could tell they’d be sweet. Also at the farmers’ market, I bought wonderful, artisanally made mozzarella–so fresh, its proud vendor promised me it would keep for 3 weeks in its water–amazing. The soppressata came from Beppi, my Southampton neighbor. Beppi is also spending his winter in South Florida, about 45 minutes from where I am, and today we decided to have lunch together. I picked him up and we had a wonderful lunch at one of his favorite local Neopolitan restaurants, where the 79 year-old owner is always thrilled to see him. Of course, as usual, our conversation turned to food. Beppi’s favorite store in Florida is Restaurant Depot, where he buys a supply of cured meats that last him the better part of the year. He buys pancetta, soppressata and capicola. Whatever he doesn’t finish in Florida, ends up in his suitcases and back in Southampton in the spring. After lunch, I accompanied him back to his apartment and he insisted on giving me pieces of soppressata and pancetta (“you can make a nice carbonara,” he suggested, as he sliced off the hunk of pancetta). He lamented not having his professional meat slicer in his Florida kitchen and we both launched into a discussion of the indignities of cooking on a glass-top electric range! This salad is so simple, no recipe is required. To begin, roast the peppers. 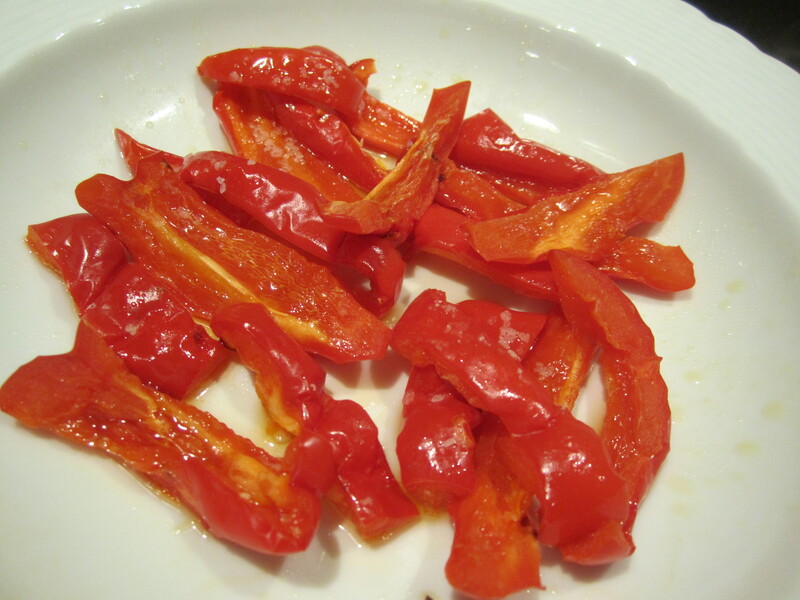 I learned a great shortcut for great microwave-roasted peppers from my mother. If you only have one or two peppers to roast and don’t want to wait forty-five minutes for oven-roasted peppers, this is the perfect cooking method for sweet, tender roasted peppers. 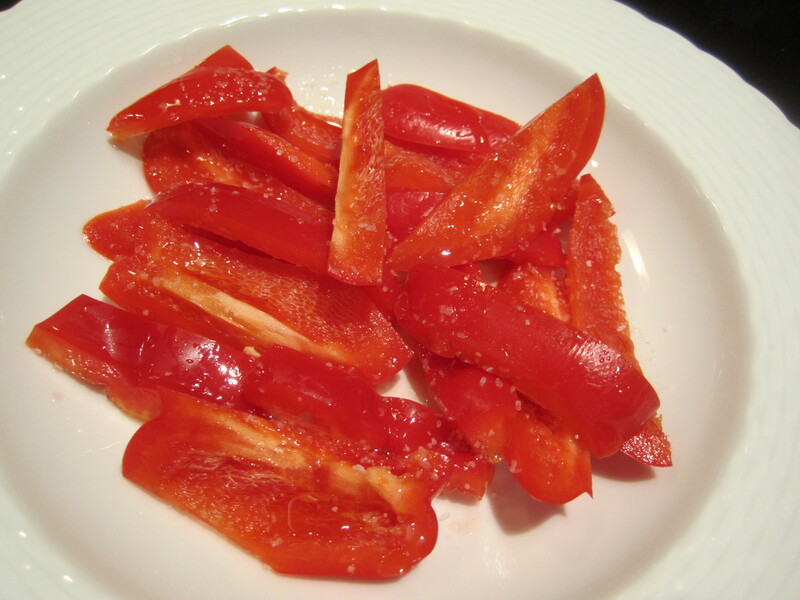 Simply slice the peppers into strips and place in a pasta bowl or flat plate. Drizzle with olive oil and sprinkle with salt. Place a paper towel over the top and roast in the microwave for about 3 to 4 minutes (depending on the age and strength of your microwave). Check on them after 2 minutes and stir them around a bit. They might make some popping sounds, but don’t worry, they won’t explode. Because this is the microwave, they must not be overcooked–stop cooking once they’ve begun to srivel and turn soft. The oil turns a wonderul red and is delicious to add to the salad. To assemble the salad, take 2 big handfuls of baby arugula/spinach blend and place in mixing bowl. Squeeze the juice of half a lemon, then sprinkle with a pinch of salt (not too much). Drizzle with 2 teaspoons of extra-virgin olive oil and toss well. 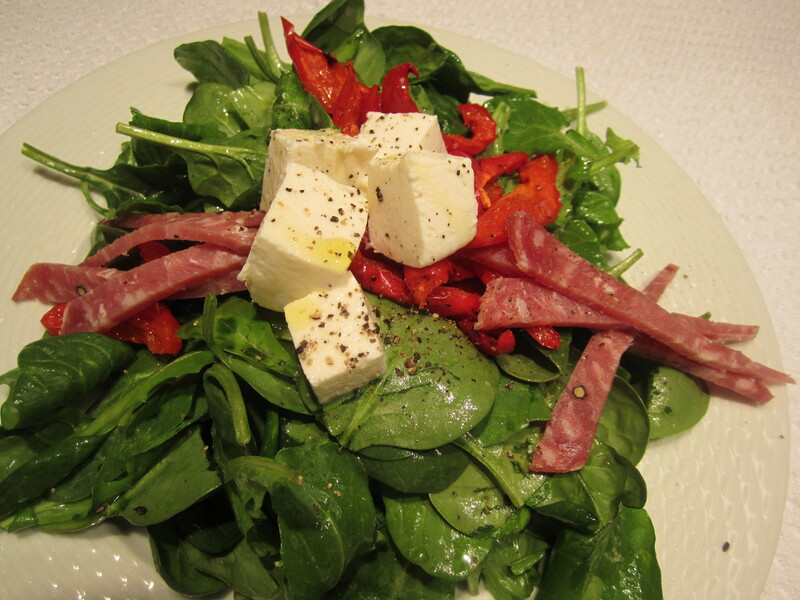 Mound the greens on a plate and arrange mozzarella, peppers, and soppressata on and around them. It’s sweet, salty and entirely satisfying, but still light and bright! 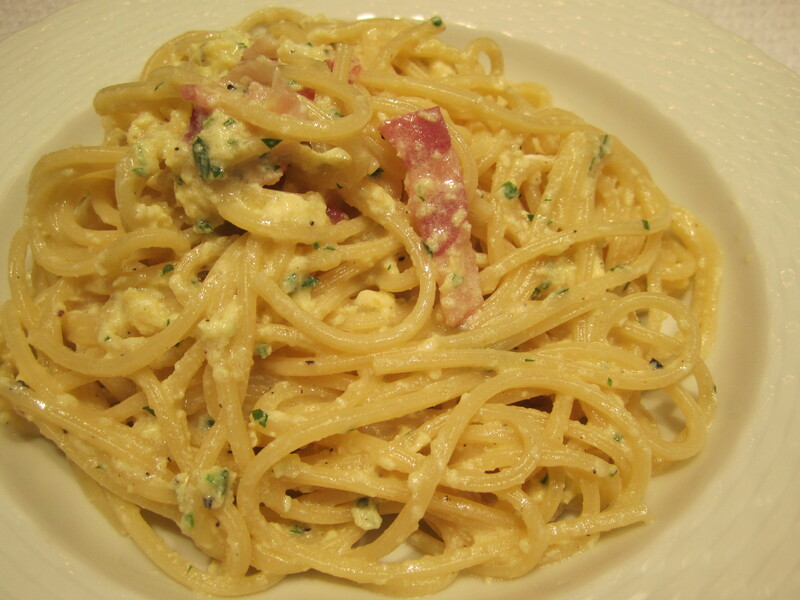 For my main course–as per Beppi’s suggestion–I made a heavenly dish of pasta alla carbonara–a great dish to make for one. This entry was posted in Dinner for One, Salads. Bookmark the permalink.